Welcome to Masihi Geet site. "Masihi Geet" is a Hindi word and it means Christian Songs. The sole purpose of putting up the Christian song site "Masihi Geet" is to bring glory to our Lord and Savior Jesus Christ. 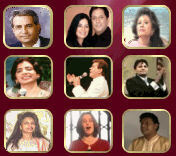 We will add many popular videos and christian songs in these pages. In future you will be able to add your own songs, albums and videos in this site. Whether you are a very popular Gospel singer or just a singer who is singing for Christ you will be able to upload your songs with your pictures (if you desire) in this site for the benefit of large viewers who are spread all over the world. We will display your songs with your picture. We will add Christian songs in various languages so that the people of all race and ethinicity may draw blessings from this site. Please click the picture for perticular artist's song. We will update the site often. Enjoy the songs and please check back again.